Bah, I'm having an off day. You ever have those? Just kind of ... overwhelmed, I guess. Life is good- all great stuff is happening, true. But today I kind of needed a head-ectomy. Dammit, should have gone to that yoga class I blew off. Oh, well. Thought I was doing a good thing by going out to browse to make myself feel better. Ended up leaving the store in tears! I want to punch my hormones in the face. Even resorted to comfort food, which I haven't been doing much lately. At least I haven't been doing it all the time. I have actually been eating pretty well most of the time. So that's a good thing, right? Right? I really wanted homemade mac and cheese but I didn't have any handy. So it was grilled cheese. Eaten in bed. While I'm feeling bad, I might as well get this off my chest: I feel like a jerk because I have about 30 emails that are in the 'respond to' folder and I just haven't. Please forgive me. I do really love the emails I receive, but just know that if you ask questions it will probably take a while for me to get back to you. Quite a while. I am the least organized person I know. 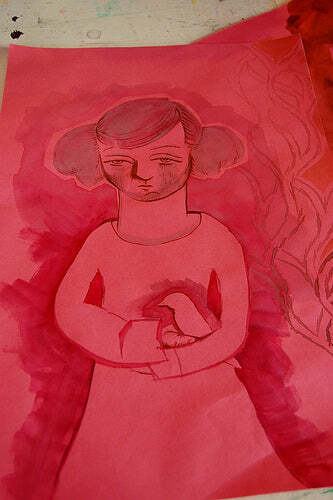 A painting I started last month. Wicked cheap watercolors on construction paper. "Princess Leia on a Sad Day. With Man Hands." He's got a way with words. Have you noticed I've been posting more lately? Do you prefer a big long post every week or more frequent shorter posts?